In only his second feature-length film, director Jang Jae-hyun cleverly builds up suspense while mixing it up with mystery and a message about religion in “Savaha: The Sixth Finger.” But it takes a U-turn toward the end, which I thought was a strange move. While it is not a bad film, I did not think the payoff was satisfying at the end of such a heart-pumping journey. The film starts with the backstory of Geum-hwa (Lee Jae-in) who was born with a twin sister she, and every member of the family, thought was a fiendish being of some sort. For 15 years, the other twin is kept locked up in a barn, locked away from the rest of the world. Christian pastor Park (Lee Jung-jae), who makes a living investigating and disclosing shady pseudo-religious groups, comes across a group that is revealed to have a suspect of a child murder in their midst. 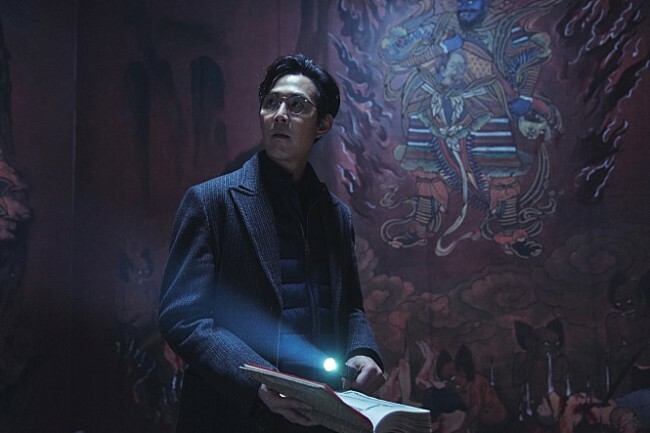 While probing the case, Park runs into mysterious fanatic Na-han (Park Jung-min) and a much darker secret held by the cult and a figure shrouded in mystery who has him questioning everything he knows about the world and his religion. Those familiar with Jang’s first film “The Priests” and have seen previews for his latest may expect an occult film, and it definitely seems that way from the beginning. But audiences soon learn that the film plays out more like a thriller that asks fundamental questions about religion. In many ways, fear and faith in an all-powerful being goes hand in hand. In the form of horror, the film challenges the audience to question what it believes to be the absolute truth. Embodying the idea is the pastor, with Lee Jung-jae delivering a solid performance. Despite his profession, he is not really a man of faith, but a man who doubts everything to find answers. I had some problems with how Park’s character was written, but he has the natural looks of a complex human being and acting skills to summon the emotions that depict his inner struggles. The rest of the cast, however, did not leave a huge impression. Lee Jae-in’s acting was good, even without consideration of the 15-year-old actress’s age, but her character was not written with much depth. Sometimes there are characters written solely to serve a purpose, which I thought was the case here. Jung Jin-young’s detective character was an enormous disappointment. Not that the veteran actor performed poorly, but his character essentially served no role in terms of the story. If you were going to have the rubber-stamp police character, why have your best actor play it? I can see what Yoo Ji-tae was going for with his calm and mysterious demeanor, but the mystery does not work that well when it is this obvious, and his performance feels far too familiar. The bits and pieces of truth come together toward the third act, and the buildup was pretty solid. But I thought the film was inconsistent in its tone. I was confused as to whether it wanted to be a mystery thriller or a film about the supernatural, which was why I thought the ending was a bit lazy. Overall, I think it is a decently acted, decently directed film, but one not written very well. However, it does have some solid moments and asks intriguing questions, so I won’t say it would be a waste of time to at least check it out. “Savaha: The Sixth Finger” opens in local theaters Wednesday.